Shopping for boat insurance is easy with Hesse Insurance Agency. We compare quotes for you! Contact us or request a quote comparison to get started. Property damage liability: Pays to repair or replace someone else’s boat, dock, or other property, if you are responsible for the damage. Bodily injury liability: Pays for injuries to another person caused while using your boat. This coverage pays for things like medical bills, lost income, & legal costs. Collision damage: Pays to repair or replace your boat if you get into an accident. Comprehensive: Pays to repair or replace your boat if it is vandalized, stolen, or damaged in an incident other than a collision. Additional coverage options: There are several additional options available depending on the type of boat, how and where you use your boat, and your personal needs. The actual amount you receive in the event of a claim depends on a few other factors like your deductible amount, liability limits, and more. 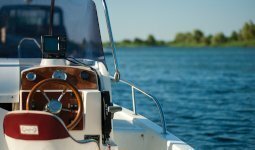 Does My Boat Need to Be Insured? Whether it’s a fishing boat, jet ski, or a yacht, pretty much any type of boat has potential to be damaged or cause damage to another person. Even if your boat is in storage, it can be vandalized or damaged in a fire. If the cost to replace your boat is more than you’d be comfortable paying out of pocket, you may want to insure it.